The Soo Theatre Project presents its 2006 Season Finale on Thursday, September 21 and Friday, September 22. Featured both evenings at 8 p.m. will be the EUP Fine Arts Council production of Harvey Schmidt and Tom Jones's classic musical, The Fantasticks. Directed by Dave Rhinard, the cast includes Karen Hughes, Phil Quinn, Lisa Dunn, Richard Morrison, Dave Rhinard, Bob Zahara, Mike Kasper and Dan Harris. The orchestra will be Maureen Delaney-Lehman on piano and Mary Lou Hughes on harp. Thursday's performance of The Fantasticks begins at 8 p.m. Tickets for Thursday's performance are $10 for adults, $5 for students, and free admission for children 5 and under. Friday's performance includes a special opening act at 6 p.m with music on stage provided by Gentleman George Snider, Roy Nason, Jack Kinney, Wild Fate, Tim Hatfield, and Dennis Brooks. The Fantasticks will follow at 8 p.m. Pizza and refreshments will be available at the Theatre from 6 to 7:30 p.m. on Friday evening. Tickets for Friday's performance are $12 for adults, $6 for students, and free admission for children 5 and under. Tickets are available at the Soo Theatre Box Office, 534 Ashmun Street, Sault Ste. Marie, Michigan. For more information, call the office at 906-632-1930. 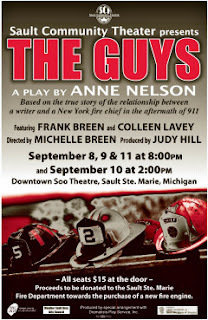 Sault Community Theater presents THE GUYS, a play by Anne Nelson, based on the true story of the relationship between a writer and a New York fire chief in the aftermath of 911. It features Frank Breen and Colleen Lavey, is directed by Michelle Breen, and is produced by Judy Hill. Performances are September 8, 9, and 11 at 8:00 p.m. and September 10 at 2:00 p.m. at the Soo Theatre, 534 Ashmun St, in Sault Ste. Marie, Michigan. All seats are $15 at the door. Proceeds are to be donated to the Sault Ste. Marie Fire Department towards the purchase of a new fire engine. The Soo Theatre Project recently received recognition from two community organizations. The United Way of Chippewa County named the Soo Theatre Project its August 2006 Volunteer Group of the Month. The award came "in recognition of outstanding service benefitting the community." Recognition also came from the Eastern Upper Peninsula Community Corrections Advisory Board "for providing opportunities to restore community integrity through participation in Public Act 511 of 1988, The Community Corrections Act." Samuel Otten, pianist and composer, will present a concert Sunday September 3, 4:00 pm. at St. James Episcopal Church, 533 Bingham Ave., Sault Ste. Marie, MI. The piano concert will benefit the Soo Theatre Arts Resource Studios (STARS) scholarship fund. Tickets are adults $10, students 6-12 $5 and under 6 free. Tickets are available at the Soo Theatre office or at the door. Mr. Otten will perform original music as well as a mix of old favorites from the Forties and Fifties and contemporary praise pieces. Sam, a 2002 graduate of Rudyard High School and 2006 graduate of Grand Valley State University, began music lessons with his mother at age four and later studied with David Erfourth, former choir director at Rudyard High. He has been composing music since he was in middle school and continues to enjoy music composition in his free time. He is currently in the Ph.D. program in mathematics at Michigan State University. Sam is excited to present a concert which will benefit arts scholarships because various scholarships have allowed him to study music as a young person. The Soo Theatre Arts Resource Studios (STARS) offers instruction in dance, music, visual arts, theatre and yoga for students of all ages. Registration for classes is open now for the fall term which begins the week of Sept. 11. Registrations are taken in person weekdays 10-6 at the STARS office.